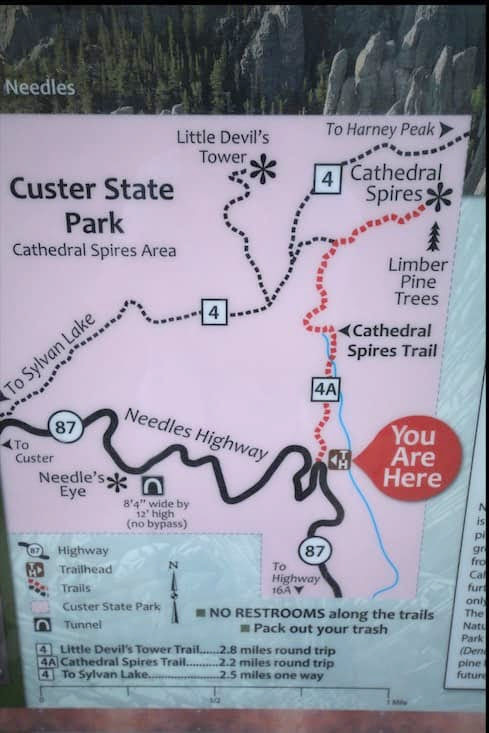 Today we’re visiting Cathedral Spires by way of the Needles Highway. 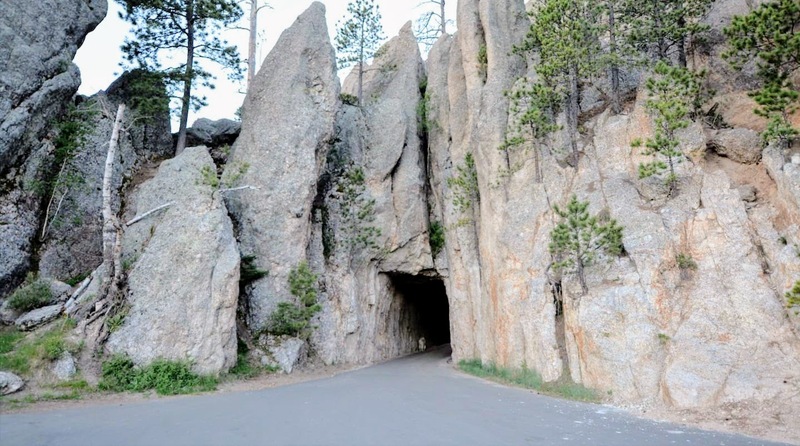 Also known as South Dakota Highway 87, the Needles Highway bisects Custer State Park in the Black Hills of of South Dakota. 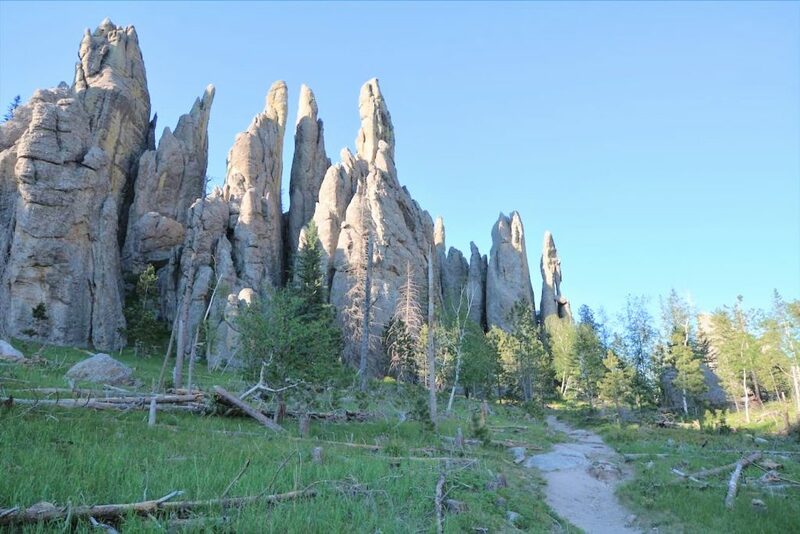 The short section of the highway between Sylvan Lake and Cathedral Spires is highly impressive, and can be a quick add-on to a half-day at Sylvan Lake, if you happen to be short on time. Of course, we recommend having more time than less. This approach tends to broaden and deepen your enjoyment of a place. 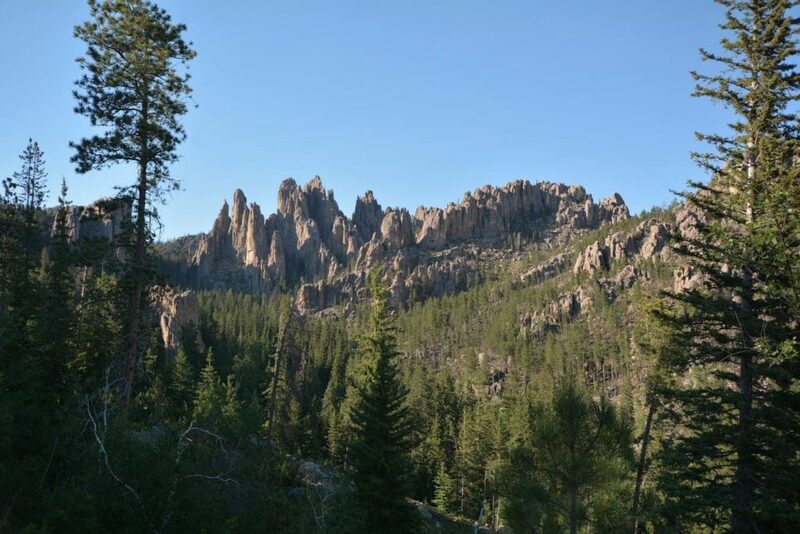 Needles and spires streak the hillsides in every direction, as well as flank the highway, itself. 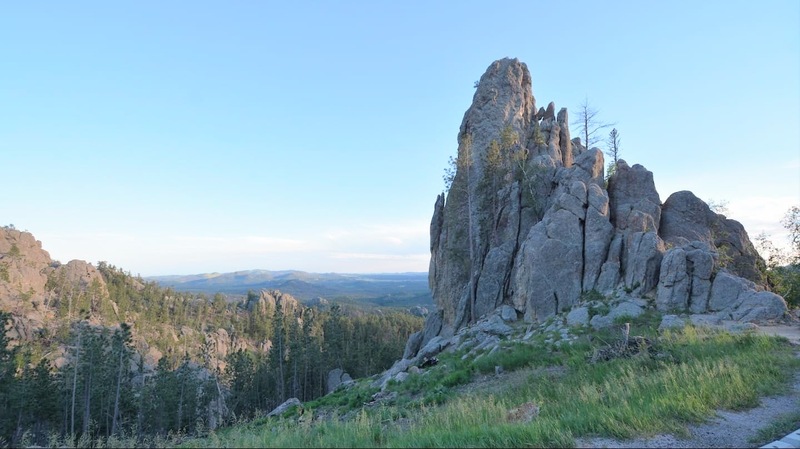 As we wind through the hillsides of Custer State Park, we get closer to our goal, the Cathedral Spires, in the distance. Shortly after parking and prepping for our hike, we found the sign below. 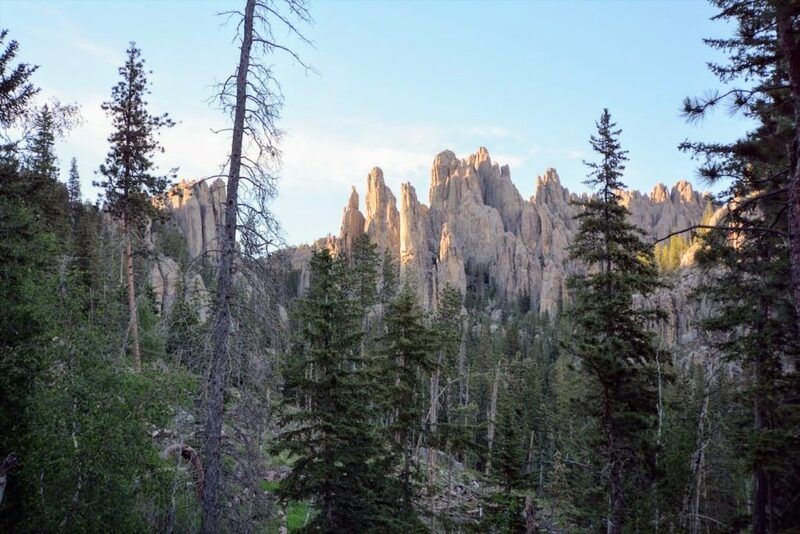 Cathedral Spires is all we’ll make time for today. A few weeks after we were here, Harney Peak (named on the sign above) was officially renamed Black Elk Peak in honor of the Sioux leader, whose nation considers the mountain a sacred site. There was as much conflict and controversy around the recent name change, as there was the original naming of Harney Peak. Army General William S. Harney and his soldiers were responsible for killing Native American women and children during an 1855 battle, near here. A couple of young couchsurfers (recently married) are staying for a couple of nights with our own couchsurfing host in Rapid City. They’re from the eastern side of the state, and they came to hike Harney (since renamed). 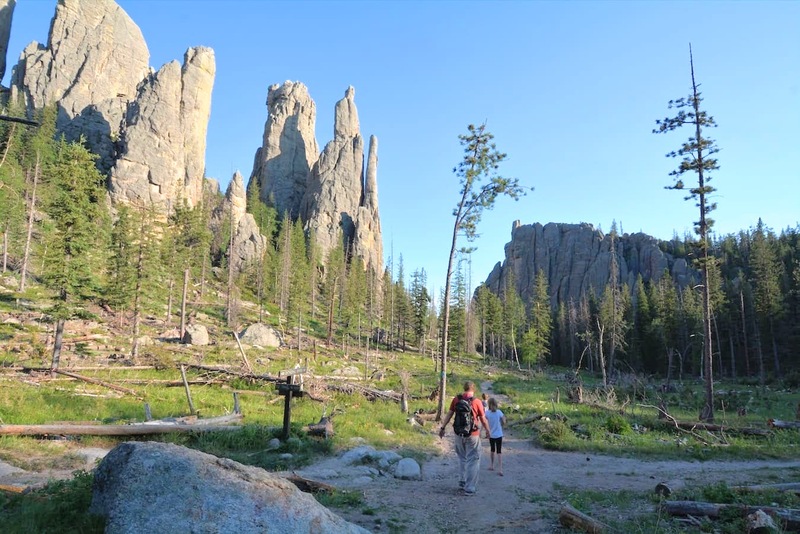 Cathedral Spires, and its surrounding spurs, represent some of the most compelling geology in the Black Hills.The trail is moderate, and mostly sticks to the canyon floor. Toward the end (midpoint of the roundtrip), you reach an impressive set of spires that you can climb around on, if you like. An interesting tidbit: The carvings on Mount Rushmore were originally proposed to be located amonth the Needles of Custer State Park. 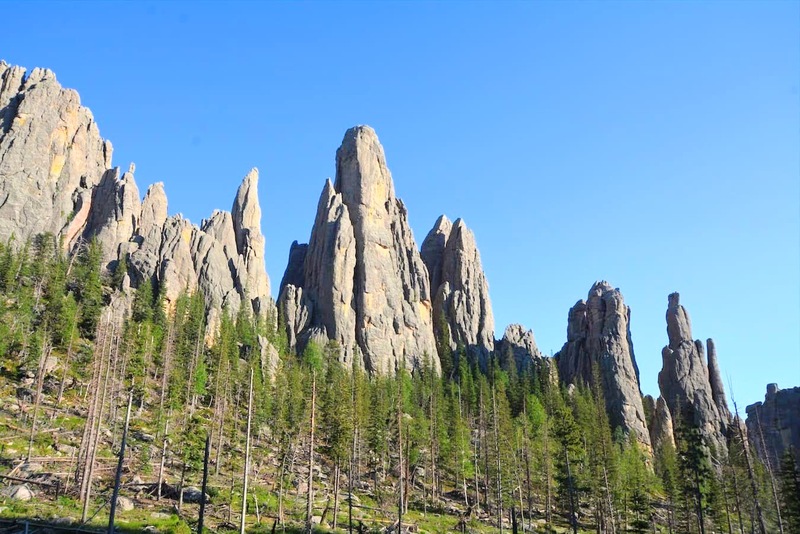 However, the sculptor realized the granite spires of this area were to fragile to support the monolithic carvings. So, they were relocated 16 miles down the road (far less, as the crow flies) to Mount Rushmore. 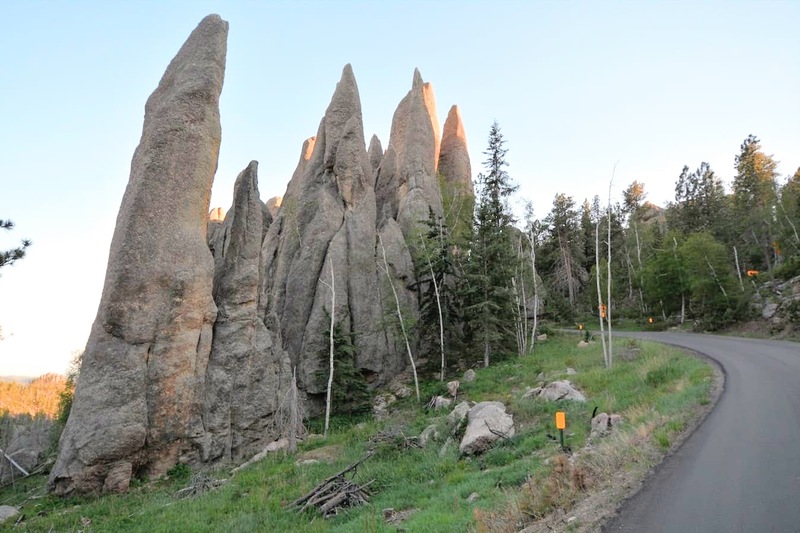 Leaving the Cathedral Spires trailhead, we continue down Needles Highway toward Sylvan Lake. Again, needles and spires flank the highway on all sides. We quickly arrive at this scenic route’s most formidable feature: the Needles Eye Tunnel. But will we make it through? We’re driving a full sized Toyota Sequoia. And this tunnel is small! And what’s that up ahead? Just inside the tunnel, there’s an animal of some sort. Tune in to part two of this post, The Needles Eye, to find out what happens! We’d love to have you on our email list. We send out a couple of communications each month that hope will add value to your own journey. Let’s Rumble!